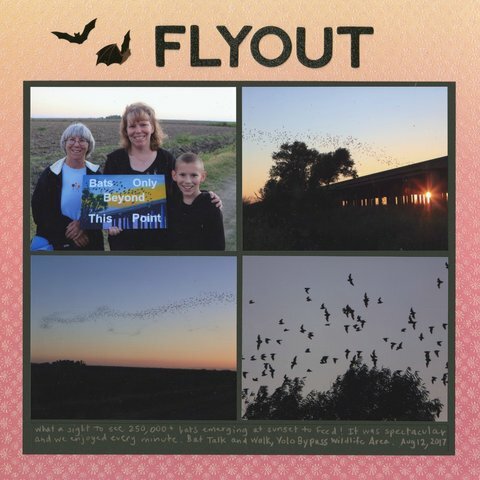 If you ever get the chance to see a bat flyout, do it!! I kept my layout really simple with just four photos matted on black. I used a colored pencil for the journaling, which I believe is the first time I've used colored pencil in any form on a layout. I've had terrible luck with white pens over the years, so I was pleased to discover how much I liked using the colored pencil. I chose a peach shade that matched the top portion of the ombre background paper, which is another great thing about colored pencils - so many color choices. This is awesome!! LOVING the photos and the colors choices!!! And I hear ya on the white pens -- those have never worked for me either! P/s: Try a white acrylic paint pen instead. Most white pens are gel-based.